VTrak D5000 series unified storage systems deliver uncompromising scalability, flexibility, and affordability for the mid-tier while providing simplicity and efficiency for minimizing total cost of ownership. Customers can respond more quickly to changing IT needs with VTrak D5000 series unified storage at an affordable price. VTrak D5000 enables data driven business with an integrated combination of high-performance hardware, adaptive storage software, and flexible protocols at an affordable price. 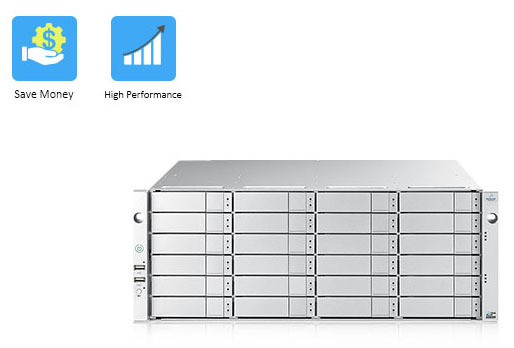 The platform is optimized for high bandwidth and low latency which makes it a perfect storage solution for mid-tier IT applications, surveillance, backup, and running multiple mixed workloads. Flash Cache accelerated VTrak D5000 storage systems deliver impressive performance, boosting throughput and lowering latency. User has option to add Flash Cache for read and write acceleration. 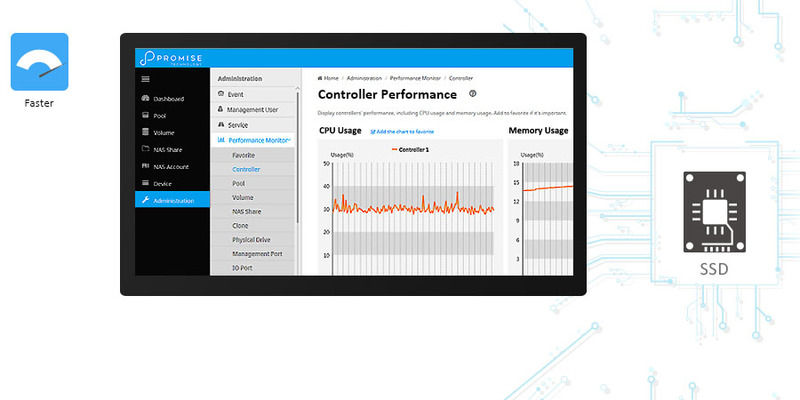 PROMISE intelligent data caching automatically promotes hot data to cache in real time, so you get the full benefit of flash performance. VTrak D5000 all-inclusive pricing bundles hardware, software, and three years of Next Business Day service at an affordable cost. VTrak D5000 series comes in four models D5300/20 (2RU), D5600 (3RU), and D5800 (4RU) giving users the flexibility on form factor. Flexible 10GbE and optional 8/16G FC, with 6G SAS/SATA1 and 12G SAS interfaces. Download the PROMISE VTrak D5000 Series Datasheet (PDF).